"The Gokova's mountainous Turquoise Coast is known for its rich history and secluded bays. Marc Anthony and Cleopatra vacationed here, and Anthony gave this region to Cleopatra as a wedding gift. Today's visitors enjoy exploring submerged Lycian ruins best viewed by private boat." Travel light is our best advice to you, swimwear and T-shirts is all you will need on board in the daytime. In the evenings people dress casually, but bring sweaters and trousers if you are coming in the cooler months. It's a good idea to bring a pair of soft shoes or sandals just to use on the boat. On board we provide hand towels only so please bring your own bath and beach towels. All this should be packed into a soft bag which can be folded and stowed away to give more room in your cabin, not a suitcase. The Mediterranean sun is very bright and on a boat hotter than you think, be sure to pack sunglasses, a good suntan lotion and a hat. If mosquitoes find you tasty then bring mosquito repellent and a camera is an absolute must. The Turkish coastline, in all its diversity has something to offer everyone, no matter what age. Starting from Bodrum a cruise could take you into the Gulf of Gokova for a week or more of complete relaxation. Pine covered slopes drop down to quiet bays and small sandy beaches where the only inhabitants are honey bees, goats and the odd fisherman. To Charter a private yacht is the ultimate vacation as you cruising along the beautiful coast of Turkey while exploring the many coves. Yachts have cabins with private bathrooms and showers with hot water, full galleys, and all have additional water sports equipment. Most of them are air-conditioned. With sailing trips of two weeks in length, routes 1 & 2 and 3 & 4 are combined. A three-week trip offers the possibility of sailing even further north or south. Other sailing routes in the Mediterranean Sea area are on a request basis. The ships sail along the Southwest Coast of Turkey and have various ports of call and departures, such as Bodrum and smaller ports in the vicinity: i.e. Marmaris, Sögüt, Fethiye and Göcek. The ports of call and departures are decided upon beforehand. The daily sailing route, which the captains attune to be the personal wishes of the passengers, is dependent on the wind and weather conditions. Several sailing routes of one, two or three weeks are possible. Best to sail with the reliable companies of course, but many of these are not very keen on their yachts ending up downwind of Athens or other larger bases. Therefore, a one way charter comes with an additional fee, but it is definitely worth your money. The major route is the Bodrum-Bodrum cruise in the gulf of Gokova with a visit to Knidos. This is where the whole idea of Blue Cruise has started. We suggest first time travelers to try this balance of small coves and ancient ruins. The other important destination is to cruise from Bodrum to Marmaris, or if the boats are available, from Marmaris to Bodrum. Marvelous scenery. 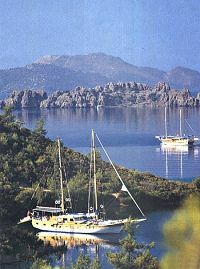 We recommend also the Marmaris to Fethiye itinary. This is also a good combination of nature of history with more ancient ruins. Antalya cruises are more rich on historic ruins since the coast does not offer the small inlets and coves it does in the Bodrum, and Marmaris Fethiye region, unique to the Bodrum-Marmaris-Fethiye region. All tours which are offered here take place on Standard-Yachts, the traditional Bodrum-built GULET. All yachts are between 19 - 25 meters length. The cabins have en-suite WC & showers. (Hot & cold). There is a music set, VHF Radiotelephone and a dinghy on each yacht, but in general no air condition. Crew consists of a captain, cook and a deckshand. Are you planning to go on holidays to Turkey? This is one of the best places to spend your holidays with the most special people in your life. Turkey has plenty of great travel destinations that you and your loved ones can visit. It also offers various activities and ways to spend your vacation here. One of the most popular and exciting is the cruise tours. You, together with your loved ones, can enjoy a relaxing cruise on a yacht here in Turkey. Prices are per person in double occupancy, including full board (three meals a day) on a one-week cruise. Drinks not included, but all drinks are available on board for extra charge. Single supplement is +40% per person. A Gulet cruise will be the holiday of a lifetime. This is the perfect way to savour the timeless beauty of Turkey's Aegean coast with day after tranquil day sailing on a turquoise sea, dropping anchor to explore idyllic little islands and swim in the warm crystal-clear waters of secluded beach-fringed bays. Flying fish... Dolphins... Breathtaking sunsets... Star-filled balmy nights... These are just a few of the vivid memories you'll treasure long after you're back on dry land. The other important destination is to cruise from Marmaris to Knidos. Marvelous scenery. Departing from Bodrum (or a port in the direct vicinity) explores the Gulf of Gökova or Güllük and takes you back to Bodrum. On the way, you call at typically Turkish ports such as rural Ören, Cökertme and Gümüslük. The latter village is famous for its excellent fish restaurants and the remnants of the sunken city of Myndos. If you like deserted sand beaches, the captain will gladly take you to Cleopatra’s Island. Legend has it that Cleopatra made love to Mark Anthony on the idyllic sand beach. Furthermore, the remnants of an amphitheatre and an agora from Greek antiquity are to be found on this small island. The various villages along the coast, such as Cnidos and Iassos breathe a rich history. Once in a while, you will feel the presence of ancient Greeks and Romans, but this sailing area will also remind you of a more recent past. During World War II, the English used the beautiful quiet, secluded Bay of Ingiliz Limani, or English Harbour, as a sally port for torpedoing German ships. The lively, worldly port and seaside resort of Bodrum is an equally good starting point for a day trip by minibus to the historic Greek/Roman City of Ephesus. This well-preserved city attracts visitors from all over the world. On the route to Ephesus, one will find some less famous ancient cities, such as Milete, Priene and Didyma. You will depart early in the morning for Knidos, an ancient Carian city to visit the remains of an amphitheater, acropolis and temple, which housed the famous statue of Aphrodite. Dinner and overnight in Mersincik. After breakfast in Mersincik you will travel leisurely to Catii Lagoon for lunch. The afternoon is yours to visit the beauties of this region. Dinner and overnight in Cati. Cruise to Yediadalar for lunch. The surroundings are picturesque and ideal for swimming. You will anchor in English Harbor where Rosemary's and a pine forest frame a lake where English war ships burrowed. Dinner and overnight. Today you will sail to Tuzla. After a free afternoon, proceed to Ballisu for dinner and overnight. Cruise to Cleopatra Island, which is famous for its beach made from seashells. You will anchor in Karacasogut for dinner and overnight. After breakfast, cruise to Bodrum. Transfer to the airport for your flight home or continue on to visit the other exciting and historical sites of Turkey. 2nd day ÇIFTLIK – BOZUKKALE Çiftlik Bay and Bozukkale. Loryma where the interesting ruins of an ancient harbour and castle. 3rd day KOCA ISLAND – BENCIK BAY Koca Island and Bencik Bay where the red rock landscape mostly covered with pine presents a quite unusual picture. 4th day KARGI BAY – DATÇA Kargi Bay and town of Datça. A small resort with many seafood restaurants and pubs. 6th day KIZIL ISLAND – BOZBURUN A little fishing village.After breakfast in Mersincik you will travel leisurely to Catii Lagoon for lunch. The afternoon is yours to visit the beauties of this region. Dinner and overnight in Catii. 7th day KADIRGA – KUMLUBÜK Amazing for swimming. Overnight in Marmaris. 8th day MARMARIS Disembarkation after breakfast. 2nd day: After breakfast in Marmaris you leave for Ekincik where you can take a river boat to visit Dalyan and the ruins of Caunos. 3rd day: The days first destination will be Manastýr where you will have lunch then sail to Tersane for your overnight anchorage. 4th day: After breakfast at Tersane you will set off and choose from one of the many tiny but beautiful bays for lunch, dinner and overnight. 5th day: Today’s lunch will be served in another secluded bay choosen on the day. From there you will head to the small port of Göcek for the night. 6th day: From Göcek, sail to Gemiler island where the boat will anchor for the day. You can enjoy the clear water for swimming, explore the ruins or take a boat to visit Ölüdeniz. 7th day: After breakfast leave for Iblis where you will have lunch and have time to swim before sailing to Fethiye or gocek harbor for your last night on board. Boarding will start at 3:30 p.m from Antalya Çelebi Marina. Service starts with dinner and overnight stay will be in this Marina. Antalya has been a residential area since the Paleolithic times. The city was under the reign of Lidia in the 7th century B.C., of Persians in 456 B.C. and of Alexander the Great in 333 B.C. After the death of Alexander, during the reign of Bergama king Attalos, a new city called Attaleia was founded and was conquered by the Selcuks in 1207. The most important historical buildings to see in the city are; ' Hadrian's Gate', 'Castle Gate', 'Clock Tower', 'City-walls', 'Inner Castle', 'Broken Minaret', Antalya Archeology Museum and 'Yivli Minare Mosque' the landmark of the city. While you have breakfast, you will be informed about the cruise programme and the boat. We will set sail to the Phasalis Bight renowned for perfume trade during antique Era where three naturel bights were founded by Colonits in the 7th.Century B.C. After lunch and swimming here, we will set sail to the ancient city of Olympos. Olympos, one of the most important port cities of Likia, has been an element of mythological stories all throughout history. Olympos Antique City where was base of famed pirates once upon a time. After the tea-time and swimming break, leaving to Adrasan Çavus Bight for dinner and overnight. Early in the morning we will set sail to Demre. After a nice breakfast in Demre you can join the tour to the ruins of Myra, a Lykian city which was also the city of bishop St. Nicholas who was known as 'the protector' of the children, the poor, and the sailors in Byzantians' time. Following this optional land tour, our yacht sails to Gökkaya Bay where we will anchor for dinner and overnight stay. After having breakfast in Ucagiz, you can take the chance to visit Simena which is located on the mountain skirts right behind Kale Köy opposite Kekova Island. There you can find the Genoese Castle and the ruins of a theatre with 300 capacity. Dinner and overnight stay will be in Kekova. Our dream journey starts after breakfast in Kas Harbour departuring through Antalya. Our yacht leaving here and stays at night in Finike harbour renowned for oranges. Our yacht departuring from Finike Marina after breakfast arrives to Ceneviz Bight passing through unique bights and coast. Arrival to Kemer Moonlight Bight after lunch and swimming in blue sea here, staying night in this beautiful after dinner. At this day that is the end of our dream journey after breakfast, after a while departuring from Moonlight Bight arrival to Çalticak Bight and Siçan Island. After lunch and swimming in this nature beauty here arrival to last stop of our tour Antalya Marina. Last dinner and staying night is here. After breakfast we will leave the boat by 10:30. Arrival & overnight in the Bodrum harbour. Cruise to Cnidus harbour to see its many ancient theatres and temples. Swimming, snorkelling and overnight in the bay of Bozukkale with its Roman fortress. Bozukkale to Marmaris. Sail to the bay of Cennet for a swim and in the afternoon depart for Marmaris where you can explore the old city and the marina. Fabulous coastline. Optional excursion to the ancient city of Caunos & to Dalyan, home of the Loggerhead Turtle. Cruise throught the unspolit. Gulf of Fethiye. Visit to Cleopatra's bay & overnight. From Cleopatra's bay to Ölüdeniz. To bath in crystal-clear waters (conservation zone) before sailing to Gemiler Island. A long to attractive harbour town of Kalkan, with its pleasant waterfront bars & restaurants. If required Patara, Letoon and Xanthos canbe visited. Cruise to charming Kas. Visit the rock tombs and the Hellenistic theatre. Sail to Kekova and the Karakol Island's calm & peaceful waters. Explore the castles before an overnight stay in Üçagiz. Ancient Phoenicus. A small commercial harbour lying in the corner of the Gulf of Finike. Overnight. The deserted bay is magnificent to bath in crystal clear waters. Overnight. Porto Genovese to Kemer - Antalya. Phaselis can be visited on the route. Antalya modern & big city is situated at the head of the large Gulf of the same name. Disembarkation. We will leave the boat by 10:30 after breakfast. Boarding starts at 3:30 p.m. from Bodrum Port. On the first day, our boat will be anchored at Bodrum Port for dinner and overnight stay. Bodrum has a history that goes back to the 12th century B.C. The city which was called ' Halicarnassus' was the birthplace of Herodotus; the ' Father of History' who lived in the 5th century B.C. The ' Mausoleum' of King Mausolus (350 B.C.) which is one of the Seven Wonders of the World is in this city. The only structure that survived from the Classical Era is the Amphitheatre. It is one of the oldest theatres in Anatolia with a capacity of 13.000 guests, and is still hosting many shows and concerts for the art-lovers in Bodrum. Another place that you should visit first at your arrival in Bodrum is the landmark of the city 'Castle of Saint Peter'. It is one of the best preserved piece of work whose history goes back to the Middle Ages. 'Myndos Gate' through which Alexander the Great entered Halicarnassus is another place that you should not miss. While you are having your breakfast, your captain will go to the Master Harbour for the harbour formalities. After the paper work at customs is completed, we will set sail to Cos Island. Asclepion, known to be the birth place of Hippocrates, 'the Father of Medical Sciences', is located here. All the East-Mediterrenean people with health problems were treated in Cos (Istankoy). Istankoy; the second largest island of the 12 islands (Dodecanese islands) has a very mild climate and very fertile lands. The island houses a 560-year-old tree, a 211-year-old fountain and a 290 km long beach. Cos is one of the islands with the best night life. Nafklirou, a street full of bars, is always crowded, colourful, and full of life. We will set sail for Simi Island early in the morning and arrive at the Monastry of Panormitis located in the southern part of Simi. It is possible to visit the Monastery and the Museum on this well-protected and peaceful bay. After having a swimming break on the eastern shores of the island we will anchor at the port early in the evening. You can see the shore-side with its neo-classical houses and the peripheral districts. You are going to adore Symi for its pine and oak forests and unique bays. We will get into Turkish waters from Datca. You can enjoy a short-walk on the shore while your captain deals with the customs procedures. After lunch in Datça and swimming stop by Aktur, we will cruise to the bay of Bencik which has a very narrow entrance but a unique view once you get inside. Bencik is located at the narrowest part of the peninsula that divides Hisaronu Gulf from the Gokova Gulf but it is closer to Hisaronu. Dinner and overnight stay will be in here. After breakfast we will be sailing into the Hisaronu Gulf . For lunch we will dock in Selimiye Bay and for dinner and overnight stay our destination will be Orhaniye. Here are a lot of bays, where we can choose one of them for overnight. You can join the optional jeep safari in Orhaniye. In Orhaniye Bay, you will see a unique scenery of a natural tidal formation called 'Kiz Kumu' (Maiden's Beach). There are so many myths about this reddish sand-path going from the shore to the inner parts of the sea. On a tiny island located in the bay you can see the wrecks of an antique castle, a sign of an ancient city. Today, we cruise back towards Marmaris. Passing around Karaburun, we arrive in Bozukkale ( Loryma ), the night will be spent in Bozukkale. In the historical city Bozukkale (Loryma), there is a castle which strectches out in a rectangle with its city walls and 9 temples. The name Bozukkale means 'crooked castle' and might be associated with the fact that one side of the castle is missing. Because of its geographical situation and the narrow port entrance, the port was also used by the Greek navy forces during the Pelepones Sea Battle. Karor, the Commander of Atina gathered all his ships here before the Cnidus War in 395 B.C. and Demetrios; the son of Antigonos used this port for the preparations before attacking Rhodes in 305 B.C. A short cruise to Serçe Limani. A Byzantine wreck from the 11th century, carrying merchandise to the eastern Mediterranean was found here. Overnighting in Çiftlik or Marmaris depending on the decision of the guests. Disemberkation in Marmaris. We will leave the boat by 10:30 after breakfast. Leaving from and returning to the lively touristic Marmaris, you will call at ports such as Datca, Fethiye, Bozburun and Göcek. Along the entire coast of Turkey antiquities are to be found, such as Xanthos, Patara and Letoon Harbour and the Lycian tombs, amphitheatres and the remnants of various temples. On your way to the antiquities in the countryside, the captain will keep an eye open for a suitable spot under the olive trees for a real picnic. “Our” St. Nicolas originates from the town of Myra. This benevolent saint used to be Bishop here. He was buried in his own church. Even though centuries ago his bones were stolen from the tomb, we can still visit his church. Besides the rich history and culture, Turkey also has beautiful flora and fauna. In the labyrinth of the Dalyan river delta, protected sea turtles have their breeding grounds. Consequently, the river delta was proclaimed a nature reserve. In small boats, you will sail along the tall river reeds through the channels to explore the delta. When sailing further into the delta, the beautiful royal tombs of ancient Caunos appear, hewn into the mountainside. A trip through the Saklikent Gorge is quite a different experience. In summer, you descend across the footbridges into the cool gorge for a walk. In winter, the water swirls high and then it is sooner a paradise for rafters than for walkers! Boarding starts at 3:30 p.m. from Bodrum Port. Early arriving guests can leave their luggage to Barbaros Yachting Office. On the first day, our boat will be anchored at Bodrum Port for dinner and overnight stay. Bodrum has a history that goes back to the 12 th century B.C. The city which was called ' Halicarnassus' was the birthplace of Herodotus; the ' Father of History' who lived in the 5th century B.C. The ' Mausoleum' of King Mausolus (350 B.C.) which is one of the Seven Wonders of the World is in this city. The only structure that survived from the Classical Era is the Amphitheatre. It is one of the oldest theatres in Anatolia with a capacity of 13.000 guests, and is still hosting many shows and concerts for the art-lovers in Bodrum. Another place that you should visit first at your arrival in Bodrum is the landmark of the city 'Castle of Saint Peter'. It is one of the best preserved piece of work whose history goes back to the Middle Ages. 'Myndos Gate' through which Alexander the Great entered Halicarnassus is another place that you should not miss. We will sail to Cnidus after breakfast. Cnidus was a developed city in science, art and architecture. Eudoxos, a very popular astronomer and maths professor; Dr. Euryphon; Polygontos, a poular painter; Skopas and Bryaksis of Faros, the most famous sculptors of the era; Sostrates, the architect of Alexandrian light house- one of the seven wonders of the World-, and Ktesias the doctor who saved the life of a Presian king from a disaster lived on this island. Dr. Euryphon and his students founded the second largest medical sciences school in Cnidus.The island also homes the largest sun clock of its time which was erected by Eudoksos. Knidos was the home for Aphrodite's monument and at those times the city was famous for brothels and became popular for sailors and Arabic tradesmen. After the lunch we will hoist sail to Datça. The city was founded by the Dors who came from Aegean Sea to the southern coast of Ionia in the 7th century B.C. The island has no humidity at all and has fresh air with plenty of oxygen. The historian Strabon has a rightful saying about Datca's weather: "God would send his beloved servants to Datça to live longer". According to a myth while the Spanish pirates were passing by the coast of Datca, they disembarked people with Hansen's disease in Sariliman Bay and these abandoned people recovered from their disease with the help of the clean weather of Datca. You can explore Datca yourself or join the optional city tour. For dinner and overnight stay we will anchor in Datca or at a nearby bay. After breakfast we will set sail for Aktur. Then our first stop will be the Bencik Bay; which has a very narrow entrance but a unique view once you get inside. Bencik is located at the narrowest part of the peninsula that divides Hisaronu Gulf from the Gokova Gulf but it is closer to Hisaronu. In 550s B.C. the Cnidus people wanted to dig a tunnel in the narrowest land piece of the penninsula between the Hisaronu Gulf and the Gokova Gulf as a defence line against the Persians. That way they would make two peninsulas one island and the defense easier. They started with diligance and put a lot of effort; however, in the end they could not manage and the city was conquered by the Persians. Dinner and overnight stay will be at Bencik Bay. Today we will be sailing into the Hisaronu Gulf. For lunch we will dock in Orhaniye Bay and for dinner and overnight stay our destination will be Selimiye. You can join the optional jeep safari in Orhaniye. In Orhaniye Bay, you will see a unique scenery of a natural tidal formation called 'Kiz Kumu' (Maiden's Beach). There are so many myths about this reddish sand-path going from the shore to the inner parts of the sea. On a tiny island located in the bay you can see the wrecks of an antique castle, a sign of an ancient city. After docking in Dirsekbükü, we will go to Bozburun. Bozburun is a small fishing town.This area was popular and suitable for sponge-diving but nowadays the people of the island are no more interested in sponge-diving as it is not worthy and is dangerous. In the last years sponge-diving is replaced by gulet tourism and Bozburun Gulets nowadays could take its place in this sector. After breakfast we will set sail for Palamutbükü. We will sail to Cnidus after lunch. Cnidus can be considered as the point which seperates the Aegean from the Mediterranean coast of Turkey so on the way back you can take the otherside of the cape. We will sail to Akvaryum after breakfast, for lunch. Then our boat will be sailing back to Bodrum Port for the last day's dinner and overnight stay. You will leave the boat by 10:30 after breakfast. Boarding starts at 3:30 p.m. from Bodrum.On the first day, our boat will be anchored at Bodrum Port for dinner and overnight stay. Bodrum has a history that goes back to the 12 th century B.C. The city which was called ' Halicarnassus' was the birthplace of Herodotus; the ' Father of History' who lived in the 5th century B.C. The ' Mausoleum' of King Mausolus (350 B.C.) which is one of the Seven Wonders of the World is in this city. The only structure that survived from the Classical Era is the Amphitheatre. It is one of the oldest theatres in Anatolia with a capacity of 13.000 guests, and is still hosting many shows and concerts for the art-lovers in Bodrum. Another place that you should visit first at your arrival in Bodrum is the landmark of the city 'Castle of Saint Peter'. It is one of the best preserved piece of work whose history goes back to the Middle Ages. 'Myndos Gate' through which Alexander the Great entered Halicarnassus is another place that you should not miss. After breakfast, we will cruise about 3 hours to cross the mouth of the Gökova Gulf and reach Cnidos. This city, moved to this strategic important point in the 4th. century BC was one of six cities forming a leauge called the Dorian Hexapolis. Knidos can be considered as the point which seperates the Aegean from the Mediterranean coast of Turkey. It has two ancient harbours and we will drop anchor in the bigger eastern harbour from where we can see the ruins. The harbour is unfortunately relatively unprotected from the wind so that captains often decide to overnight in nearby Palamutbükü bay. We will go to Bozburun. Bozburun is a small fishing town.This area was popular and suitable for sponge-diving but nowadays the people of the island are no more interested in sponge-diving as it is not worthy and is dangerous. In the last years sponge-diving is replaced by gulet tourism and Bozburun Gulets nowadays could take its place in this sector.And overnighting will be here. Passing around Karaburun, we arrive first in Bozukkale (ancient name=Loryma) seaside village. Altough the Turkish name means "ruined castle", the castle on a hill at the entrance to the port is in relatively good condition. You can visit the ancient castle of Lorym, before dinner and overnight stay. After breakfast we cruise further to Serçe Bay. We will sail to Kadirga or Kumlu Bükü after lunch,for diner. Overnight will be in Kadirga. We will cruise to with Ekincik Gulf. If you want, you may join our optional Dalyan Tour from here. In this tour you will enjoy the natural beauty of the delta as you pass along by the river boat called Piyade. Finally you will arrive in Dalyan which is a Karian City known to be founded by Miletos' son. Besides its ancient value with its Rock Tombs, Akropol Castle, Ancient Theater and Basilica complex, Dalyan is also well-known for it natural beauty with Caretta- Caretta (Iztuzu) Beach. Following a rejuvenating Mud Bath the final destination of the day will be Turtle Beach. Dinner and overnight stay will be in Gulf of Ekincik. After breakfast we will be cruising to Paradise Island, overnight will be at Marmaris Harbour. Boarding starts at 3:30 p.m. from Bodrum. On the first day, our boat will be anchored at Bodrum Port for dinner and overnight stay. Bodrum has a history that goes back to the 12 th century B.C. The city which was called ' Halicarnassus' was the birthplace of Herodotus; the ' Father of History' who lived in the 5th century B.C. The ' Mausoleum' of King Mausolus (350 B.C.) which is one of the Seven Wonders of the World is in this city. The only structure that survived from the Classical Era is the Amphitheatre. It is one of the oldest theatres in Anatolia with a capacity of 13.000 guests, and is still hosting many shows and concerts for the art-lovers in Bodrum. Another place that you should visit first at your arrival in Bodrum is the landmark of the city 'Castle of Saint Peter'. It is one of the best preserved piece of work whose history goes back to the Middle Ages. 'Myndos Gate' through which Alexander the Great entered Halicarnassus is another place that you should not miss. After breakfast, we will cruise about 3 hours to cross the mouth of the Gokova Gulf and reach Cnidos. This city, moved to this strategic important point in the 4th. Century BC was one of six cities forming a league called the Dorian Hexapolis. Cnidos can be considered as the point which separates the Aegean from the Mediterranean coast of Turkey. It has two ancient harbours and we will drop anchor in the bigger eastern harbour from where we can see the ruins. The harbour is unfortunately relatively unprotected from the wind so that captains often decide to overnight in nearby Palamutbükü bay. After breakfast we will sail and anchor at Datça. We will get the basic needs of the boat such as food, beverages etc. from this port. Datça was founded by the Dorians who came from Aegean Sea to the southern coast of Ionia in the 7th century B.C. The island has no humidity at all and has fresh air with plenty of oxygen. The historian Strabon was right when he remarked of Datça's weather: "God would send his beloved servants to Datça to live longer". According to a myth, while the Spanish pirates were passing by the coast of Datca, they disembarked people with Hansen's disease in Sariliman Bay and these abandoned people recovered from their disease with the help of the clean weather of Datça. You can explore Datça by yourself or join the optional Cnidus tour. For dinner and overnight stay, we will anchor in Datça or at a nearby bay. We will go to Bozburun. Bozburun is a small fishing town. This area was popular and suitable for sponge-diving but nowadays the people of the island are no more interested in sponge-diving as it is not worthy and is dangerous. In the last years sponge-diving is replaced by gullet tourism and Bozburun Gullets nowadays could take its place in this sector. Passing around Karaburun, we arrive first in Bozukkale (ancient name=Loryma) seaside village. Although the Turkish name means "ruined castle", the castle on a hill at the entrance to the port is in relatively good condition. You can visit the ancient castle of Lorym, before dinner and overnight stay. After breakfast we cruise further to sail to Kadirga Bay or Kumlu Bükü. For lunch we will cruise to with Ekincik Gulf. If you want, you may join our optional Dalyan Tour from here. In this tour you will enjoy the natural beauty of the delta as you pass along by the river boat called Piyade. Finally you will arrive in Dalyan which is a Karian City known to be founded by Miletos' son. Besides its ancient value with its Rock Tombs, Akropol Castle, Ancient Theater and Basilica complex, Dalyan is also well-known for it natural beauty with Caretta- Caretta (Iztuzu) Beach. Following a rejuvenating Mud Bath the final destination of the day will be Turtle Beach. Dinner and overnight stay will be in Gulf of Ekincik..
After breakfast we will sail to Turunc Fountain for lunch. Stop over at Kizil Island for dinner and overnight. After breakfast we will sail to Tersane Island, numerous ruins around the shores of the creek date from Byzantine times. After lunch the yacht will turns its route to Göcek Harbour, arriving late in the afternoon. Dinner and overnight in Göcek. After breakfast on board, the guests disembark by 10:30. Arrival Fethiye, welcome coctail. The resort town of Fethiye overlooks a beautiful bay strewn with islands and carriers the secrets of the ancient gods of mythology. Cruising to Tersane Island- numerous ruins around the shores of the creek date from Byzantine times & later, overnight Agalimani. Cruising around the wonderfull bays in the Gulf of Fethiye, Sarsala-Bedri Rahmi Bay and visit Telmessos. Exploring Sunken Bath ( Batikhamam ) & Cleopatra's bay where you cansee conspicuous ruins of several old stone buildings right on the waters edge. Cruising to Yassica Islands, overnight at Göcek set in a beautiful pine forest, is one of the Mediterranean's best sailing spot. Explore Blue Lagoon ( Ölü Deniz ), where the calm, crystal water, overnight at Gemiler Island. Byzantine ruins lie tucked among the pines. Stop over at Kizil Island and then to Fethiye overnight at the harbour. Boarding starts at 3:30 p.m. from Göcek Port. On the first day, our boat will be anchored at Göcek Port for dinner and overnight stay.The Gulf of Göcek set in a beautiful pine forest, is one of the Mediterraneans best sailing spot.Dotted with islands and intended with many coves,its land and seascape are stunning.The ruins of Arymaxa,the ancient city at the southern tip of the gulf,lie at the edge of the azure waters.Göcek Town itself is an emerging tourist destination and yacht haven.Local merchants here sell traditional carpets,arts and crafts. Exploring Sunken Bath (Batikhamam) & Cleopatra's bay where you can see conspicuous ruins of several old stone buildings right on the waters edge. Sailing to Tersane Island, numerous ruins around the shores of the creek date from Byzantine times.Next stop will be Bedri Rahmi Bay,is one the most popular bays in Göcek Gulf,which is located opposite Tersane Island and known as Taskaya Bay.Bedri Rahmi Eyüpoglu was a great writer and painter of Turkey. He and his close friends were the first blue voyagers of the country who discovered the beatiful Lycian coast and informed people about yhis amazing area.On one of his cruises ,he painted a fish on a rock behind fountain of the bay just before his death in 1973,and ever since the bay has been called by his name. Sailing to Turunc Fountain for lunch.Stop over at Kizil Island and then to Fethiye overnight at the harbour. Explore Blue Lagoon (Ölüdeniz), where the calm, crystal water, overnight at Gemiler Island. Byzantine ruins lie tucked among the pines. After the breakfast, we will be visiting uniquely beautiful islands and finally hoist near Zeytin Island. Following lunch and a swimming break we will sail to Yassica Islands to spend the night and cherish the wonderful scenery. Sailing to Göcek Island where the yacht spends its last day travelling around these beautiful islands. After lunch the yacht will turns its route to Göcek Harbour, arriving late in the afternoon. Dinner and overnight in Göcek. Arriving to Marmaris Harbour Board the yacht in Marmaris and sail for Kumlu Buku for a relaxing afternoon of swimming and perhaps a walk to the ruins of ancient Amos. Dinner and overnighting will be here. Following breakfast we cruise to Ekincik Bay, where we will leave our yacht for an afternoon tour of ancient Caunos and Dalyan. We make our way inland along the reed-lined channels of the Dalyan River delta, keeping an eye out for turtles, herons and kingfishers. At Caunos we visit the remains of a theatre, a Byzantine church, a Roman bath house and an Agora before passing underneath a spectacular set of Lycian rock tombs, carved into the cliff face above the Dalyan River. Dinner and overnight stay in Ekincik. After a morning's sail south-east from Ekincik, we round Cape Kurdoglu and drop anchor in Kizilkuyruk Harbour. After lunch there is the opportunity to swim, snorkel, waterski and windsurf in the sheltered waters of the bay, or to take an overland hike to the ruins of ancient Lydae in the hills. Our overnight destination in the picturesque Skopea Liman is Manastir Bay, where we can swim over the partially submerged ruins of a monastery. We will stay here for dinner and overnighting. Crossing the Gulf of Fethiye, we reach Gemiler Island by lunchtime. Following a relaxing afternoon of swimming and snorkelling over sunken ruins, we take a tender boat ashore to explore the island. Walk around the remains of a sizeable Byzantine settlement and see a beautiful mosaic in one of the churches. Marvel at the covered walkway and peer into dwellings and a cistern. Take advantage of the fabulous view from the summit and sit down with champagne glass in hand whilst watching the sun set over the sea. Dinner and overnight stay in here. After breakfast, depart for the long cruise past the Seven Capes to Kalkan. Lunch in the harbour, then enjoy an overland tour to the Lycian cities of Letoon, Patara and Xanthos. Xanthos was the capital of the Lycian league, which rose to the height of its splendour in the 10th century BC. Patara, recognised by scholars as the birthplace of Apollo, has a magnificent history dating back as far as the 7th-century BC. Patara was an important place of trade in antiquity and excavations being carried out today are uncovering more and more of this extensive site. Letoon was a place of worship for the people of Xanthos and the most important ruins are those of the Temples of Leto, Apollo and Artemis. Letoon is cited in many guidebooks as one of the most delightful sites in Lycia. Dinner and overnight stay will be here. Early morning departure for Kekova. Lunch on board. Later in the afternoon, we anchor beneath the medieval castle of ancient Simena at Kale. An energetic climb up the hill behind the village takes us to the castle where we enjoy an excellent view of the Kekova Roads. From here we can also see the remains of the old quay, a partially-submerged sarcophagus and some interesting steps cut into rocks. Overnight in nearby Ucagiz, Final goodby dinner on board. Embarking the yacht in Marmaris. Welcome drink and information about the yacht and the tour programme. Dinner and overnight in Marmaris. After harbour formalities departure to Rhodes. In about 2 hours, we will cruise into the harbour of Rhodes. After the lunch in the harbour, we recommend you a walk around the magnificient Crusaders Castle. Dinner and overnight in the harbour of Rhodes. Cruising to Symi. On the way, swimming and lunch stops in the little bays surrounding the island. Dinner and overnight in the harbour of Symi. Arriving in Datça by a short cruise. After lunch and a few hours time to be spent in Datça, we will cruise towards evening to the bay of Kargi or Palamutbükü.. Dinner and overnight will be in here. Towards midday, we arrive the ancient harbour of Cnidos, which surroundedwith the ruins of this ancient city. The harbour is unfortunately open to the wind, therefore we will cruise towards evening from Cnidos to Mersincik bay on the northen side of peninsula for overnighting. Cruising to Çökertme bay. In the afternoon, swimming stops in this region. Overnight by Orak Island. Swimming and lunch stops by Karaada and Adabogazi. Towards evening the harbour of Bodrum. Welcome on board and meeting with crew. You will have a dinner and spend the first night at the Marina of Bodrum. on board. Choice of swimming in the warm waters of Empros thermal baths on the south coast or in a nearest beach to the center. Dinner and overnight on board in the Harbour of Cos. Kos is also reputed for being one of the best party islands. After the breakfast cruising to the beautiful island of Leros. A mountainous, green island with high cliffs and many small bays and villages, Leros is a popular holiday resort which still has kept most of its genuine atmosphere. One of the reasons is that it is not too dependent on tourism. Many of the buildings on the island are built in Italian style, but you'll also find those typically Greek little white houses with blue doors and windows. Dinner and overnight on board in the Leros Marina. Cruising to Patmos Island. Patmos is not a big island, but it is one of the best known. It was here St. John had his vision and wrote the apocalypse, and this is why Patmos is sometimes called "The Jerusalem of the Aegean". The Monastery of St. Johns towers above the capital, Chora, and the whole island breathes of faith and devotion. According to mythology, Patmos was a present from Zeus to his daughter Artemis, goddess of hunting and young women. She was worshipped here in antiquity, and the monastery of St. John was built on her temple. After breakfast we may have a walk through the monasteries. Overnight and dinner in to Patmos Harbour. After breakfast, departure to Kalymnos. Kalymnos is part of the Dodecasene and is lying between the islands of Kos and Leros. It is an attractive island with a population of 12000 inhabitants, which are mostly leaving in the capital and main port. Kalymnos is famous for its sponge fishing industry. Dinner and overnighting on the board in the Kalymnos Marina. After Breakfast departure back to Cos. Dinner and overnighting on the board in the Kos Marina. After breakfast, departure back to Turkey to Bodrum Marina. You may visit castle in here. It was built by Rodos Knights and It is turned into one of the greatest Underwater Archeology museum of the world. Dinner and overnight on board. Boarding the yacht in Bodrum. Welcome drink and information about the yacht and the tour programme. Dinner and overnight in the harbour of Bodrum. After breakfast, cruising to the island of Büyük Kiremit where the guests have a chance to relax. After lunch here, we will sail to the little naturel harbour of Gümüslük (Ancient Myndos ). Dinner and over night here. Cruising in the morning, we arrive Panayir Adasi at the northen coast of the gulf. Breakfast will be served enroute. After lunch,we will sail to Altinkum. We advise you to make an excursion to the ancient city of Didyma. After breakfast in Altinkum, we alo advise you to make an excursion to the ancient cities of Priene, Miletos. Overnight and dinner will be in one of the bays near Altinkum. After breakfast, we will sail up ( depend on the wind condition) to Çam Limani where will have a lunch. In the afternoon we cruise to the charming Kiyikislacik village (Ancient Iasos), a little harbour surrounded by lovely fishrestaurants, and do not forget to make a trip to the ruins of ancient Iasos. Dinner and overnight here. After breakfast, we will leave Iasos and cruise to the Salih Island. After lunch in the Salih Island, we cruise to Türkbükü for an overnight and dinner. Today we will cruise to Yalikavak, then stop in Çatal Island for the last night. Dinner and overnight here. Early in the morning sailing to Bodrum. Disemberkation after breakfast in the Bodrum harbour. Boarding starts at 3:30 p.m. from Bodrum Port. Early arriving guests can leave their luggage to Barbaros Yachting Office. On the first day, our boat will be anchored at Bodrum Port for dinner and overnight stay. While you have breakfast, you will be informed about the cruise programme. After the paper work at customs is completed we will set sail to Cos Island. Asclepion , known to be the birth place of Hippocrates, 'the Father of Medical Sciences', is located here. All the East-Mediterrenean people with health problems were treated in Cos (Istankoy). Istankoy; the second largest island of the 12 islands (Dodecanese islands) has a very mild climate and very fertile lands. The island houses a 560-year-old tree, a 211-year-old fountain and a 290 km long beach. Kos is one of the islands with the best night life. Nafklirou, a street full of bars, is always crowded, colourful, and full of life. We will set sail for Symi Island early in the morning and arrive at the Monastry of Panormitis located in the southern part of Symi. It is possible to visit the Monastery and the Museum on this well-protected and peaceful bay. After having a swimming break on the eastern shores of the island we will anchor at the port early in the evening. You can see the shore-side with its neo-classical houses and the peripheral districts. You are going to adore Symi for its pine and oak forests and unique bays. Sailing to Rhodes early in the morning. Rhodes is the largest of the Dodecanese islands. The island is a very popular holiday place as it has one of the best-protected and the largest European Medieval city and has warm weather 300 days of a year. Rhodes has been a home for many civilizations; starting with the knights of St.John in the Middle Ages, then Ottomans and Italians; thus the island has a unique historical harmony and beauty. The main port Rhodes is the Rhodes City which bears the same name with the island. The other very touristic areas of Rhodes island are; Lyndos and Kamiros. The city, which is still surrounded by 12meter-thick city-walls, gives you the feeling of travelling back to Medieval times especially when you walk around its narrow, stone-paved roads. After dinner, our guests are highly recommended to enjoy a Rhodes night out. Departing after breakfast to the Datça, while your captain doing the port formalities you may have a walk in through the city center. Datça is a friendly lively port during the daytime offering a variety of shops and a good selection of restaurants and bars along the waterfront. Departing from Datça and have a swimming stop in a bay. Dinner and overnight would be at Palamutbükü which is a lovely fishing village. Early in the morning cruise to Knidos (Cnidus ), one of the six cities of Dorian Hexapolis to see ancient theatres & Temples. Long centuries ago Knidos was a major Dorian city, celebrated for its temples, theatres, statue of Aphrodite, the world's first observatory, and medical school.The town, renowned for its history as much as for its geography, and boasting an attractive landscape, used to have two ports; one for commercial and one for military purposes. According to the historian Strabon, the military port was large enough to hold 20 warships and its entrance used to be closed off with chains when necessary; whereas the second port to the south, the commercial port, used to have a windbreaker extending out from both sides. Knidos used to be surrounded with 15-kilometer (9-mile) city walls and had three entrance gates; two on the northern and one on the eastern wall. The acropolis was located on a hill northeast of the city. As far as is understood from the surviving ruins, the town used to have two theaters, one Odeon, two temples, a stoa, an agora, and a number of other buildings. The most interesting among them was perhaps the Temple of Aphrodite. The boat will anchor for the night in Mersincik. After breakfast, departure for Çiftlik perhaps enjoy your last swim in cristal clear water. Overnight in the bay or Harbour of Bodrum. After breakfast on board, the guests disembark in Bodrum Harbour. Please note that this is only a rough guide and can be varied to suite requirements. Also note that the route may vary slightly, depending on weather conditions and time available, at the Captains discretion. Following routes can be merged for the longer periods, such as ten days or two weeks. The southwest and the south coast of Turkey has one of the richest arrays of historical sites to be found anywhere in the world.The more famous of these are the ancient cities of Pergamon, Ephesus, Miletus, Cnidus, Xanthos, Myra, Perge, Aspendos and Side.Whatever our clients stay in a resort hotel or joined the luxury yacht charters or the discount cruises they feel the mystic atmosphere of this ancient cities during their stay..
Our cruises are operated between the harbours of Kusadasi, Bodrum, Marmaris, Gocek, Fethiye, Kalkan, Kas and Antalya and can also take in the neighbouring Greek islands of the Dodecanese. This part of the coastline is scattered with sheltered bays and coves of turquoise waters, with ancient ruins and archeological sites surrounded by thick pine tree forests and dramatic mountain scenery. The itineraries of our private and luxury gulet cruises are tailor-made and the result of many years of experience. Our itineraries are therefore very well balanced, offering an intensive and varied insight into all the beauties not be missed in the cruising area. In addition to the above itinerary examples, we are well able to customize a completely different route according to your wishes and work out for you interesting itineraries for a private gulet charter of 2 weeks or more. The choice of itineraries for a private gulet charter is subject to the availability of ports of embarkation/disembarkation at the time of reservation and the duration of the cruise. As every gulet itinerary has a different accent on what to see and do during the cruise, it will be most helpful to know your main interest and expectations from your holidays thus enabling us to suggest you appropriate routes and customize the cruise according to your preferences. for those who are interested in history, old civilizations and the visit of magnificent ancient sites. for those who like walking across green forest hills to spectacular viewpoints or from bay to bay and explore the natural beauties of the coastline. for those who do not want to commit themselves to a certain theme in advance and wish to experience a bit of all the essentials of a gulet cruise. Leaving from and returning to the lively touristic Marmaris, you will call at ports such as Datca, Fethiye, Bozburun and Göcek. Along the entire coast of Turkey antiquities are to be found, such as Xanthos, Patara and Letoon Harbour and the Lycian tombs, amphitheatres and the remnants of various temples. On your way to the antiquities in the countryside, the captain will keep an eye open for a suitable spot under the olive trees for a real picnic. “Our” St. Nicolas originates from the town of Myra. This benevolent saint used to be Bishop here. He was buried in his own church. Even though centuries ago his bones were stolen from the tomb, we can still visit his church. Besides the rich history and culture, Turkey also has beautiful flora and fauna. In the labyrinth of the Dalyan river delta, protected sea turtles have their breeding grounds. Consequently, the river delta was proclaimed a nature reserve. In small boats, you will sail along the tall river reeds through the channels to explore the delta. When sailing further into the delta, the beautiful royal tombs of ancient Caunos appear, hewn into the mountainside. A trip through the Saklikent Gorge is quite a different experience. In summer, you descend across the footbridges into the cool gorge for a walk. In winter, the water swirls high and then it is sooner a paradise for rafters than for walkers! © pixelwork bodrum 1998-2012. All Rights Reserved.